Dr. Herb Kandel accepted the Environmental Protection and Sustainability Award from Santa Barbara County Action Network during a dinner Sunday at the Radisson, and gave credit to others who worked to protect the environment. He also recognized landowners, and called them "heroes" for putting their properties into conservation easements. People need to learn from diverse members of the community, including youth, to move the conservation effort forward, he said. Five others were recognized at SBCAN’s North County “Looking Forward” Award Dinner and Fundraiser: Steve Heuring, Patricia “Pati” Cantú, Elsa Velasco, Virginia Perry Souza and Ines Ruiz. Platform Holly has stood alone in the South Ellwood oil field for decades as the Santa Barbara Channel’s last oil rig in California’s state waters. But it may not stay standing for much longer. The platform’s owner, Venoco, announced on April 17 that it filed for Chapter 11 bankruptcy—which allows the company to reorganize assets—and quitclaimed the South Ellwood oil field, returning the lease to the state. 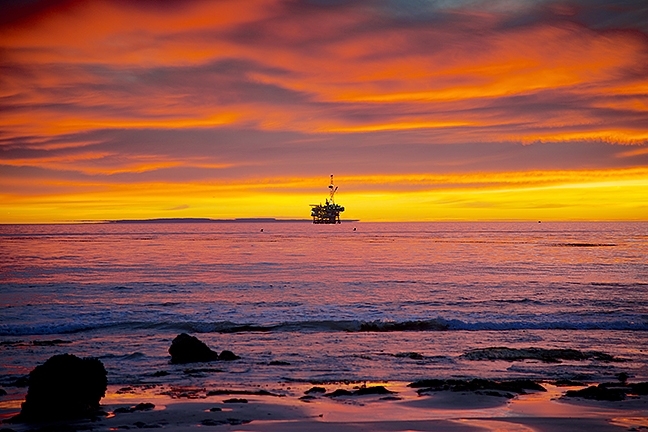 With Venoco abandoning the field and platform Holly, the State Lands Commission will begin decommissioning the platform—a development that illustrates the decades-long debate in Santa Barbara County over oil production, especially offshore drilling. Venoco made clear its reason for shutting down Platform Holly: Since Plains All American Pipeline stopped all transport of Venoco’s crude from its Ellwood Onshore Facility after the Refugio oil spill in 2015, the platform was dead in the water. Plains’ Line 901 leaked more than 140,000 gallons of oil into the ocean on May 19, 2015, marring coastline for miles in either direction with black, odorous crude, affecting businesses as small as family-owned fishing boats and as large as Venoco. After Venoco failed to petition the State Lands Commission to adjust and expand the lease boundaries of the South Ellwood field earlier this year, the company had no hope for Holly. The move to walk away was due to a number of “unfortunate circumstances impacting the company’s financial strength,” Venoco’s COO Mike Wracher said in the company’s April 17 statement. The statement named Plains’ nonoperational Line 901 as a deciding factor. About 20 people attended a Monday night forum in Solvang designed to gather support for blocking new oil wells in Santa Barbara County, pushing for full renewable energy sources in the county and state and ending California’s cap-and-trade program. The group gathered in the Legion Wing of the Veterans Memorial Building to hear four speakers discuss plans for more than 700 “new” oil wells in the county, the potential for wells to contaminate groundwater, restrictions on developing alternative energy and the failure of the cap-and-trade program to reduce greenhouse gas emissions. Speakers were Alena Simon, Santa Barbara County organizer; Adam Scow, California director of the national nonprofit organization Food & Water Watch; Rebecca August, of Safe Energy Now; and Ken Hough, of the Santa Barbara County Action Network. Their presentations and audience questions were reserved until Andy Caldwell, executive director of COLAB, the Coalition of Labor, Agriculture and Business, questioned some of the statements and claimed they were misleading scare tactics. Then interactions between Caldwell and audience members became contentious and nearly deteriorated into an arguing match before organizers calmed things down and began disbanding the meeting. With a 3-1 vote Tuesday, the San Luis Obispo County Board of Supervisors denied appeals filed after the Planning Commission last year voted down Phillip 66's contentious oil-by-rail proposal. North County Supervisor Debbie Arnold was the lone dissenter in the decision. Chairman John Peschong recused himself from the hearing that began Monday because of his consulting background with the oil industry. "My fear is that today's decision puts trucks on the road with highly flammable material," Arnold said in her dissent. Phillips 66 has applied for a development plan and coastal development permit to modify its existing rail spur at the refinery and install rail unloading facilities at its Nipomo Mesa refinery in order to bring in unrefined heavy crude oil there via train. Project plans also call for extending the facility's existing rail spur, and constructing five parallel tracks and a rack area to allow unloading up to three oil trains per week, not to exceed 150 a year. Trains would consist of 80 rail cars carrying approximately 27,300 gallons each, totaling approximately 2.19 million gallons of crude oil. The San Luis Obispo County Board of Supervisors chambers once again were filled with opponents of a controversial proposal by Phillips 66 to bring crude oil to its Nipomo Mesa refinery via trains. About a 160 people turned out Monday in San Luis Obispo for the first day of an appeal hearing of the county Planning Commission's denial late last year of the proposed project. Half of those spoke during the daylong meeting. Phillips 66 has applied for a development plan and coastal development permit to modify its existing rail spur at the refinery and install rail unloading facilities at the refinery in order to bring in unrefined heavy crude oil there via train. The Planning Commission turned down the proposal in a split vote last October after eight public hearings and hours of public testimony. Most speakers voiced opposition to the plans. Those voices, which came from far and wide, didn't change during Monday's public comment portion of the appeal hearing, which will continue at 9 a.m. Tuesday at the County Government Center, 1055 Monterey St. in San Luis Obispo. "This is the first time in 15 years we have ever spoken outside Santa Barbara County," said Ken Hough, Santa Barbara County Action Network executive director. "We never had the need to ... until now." Hough told the four supervisors — Chairman John Peschong recused himself from the hearing because of his consulting background with the oil industry — his organization stands with Santa Barbara County in its opposition to the proposed rail spur project. The Santa Maria River Levee is there to protect city residents from potentially dangerous mountain water runoff and as a place for folks to gather along its trail to exercise and see Santa Maria’s plants and wildlife. Earlier this year, some residents reached out to the city with an idea to dedicate the levee’s trail to someone that, like the levee, has worked to protect residents and bring them together. Thomas Urbanske served as a city councilman and county supervisor for decades. Before entering into public service, Urbanske touched many lives as an educator in Santa Maria. City officials and others gathered Wednesday morning at the Seaward Drive entrance of the multi-use levee trail to rededicate it the Tom Urbanske Levee Trail. “Today is a special day for all of us in Santa Maria,” Mayor Alice M. Patino said in a letter read during the ceremony. 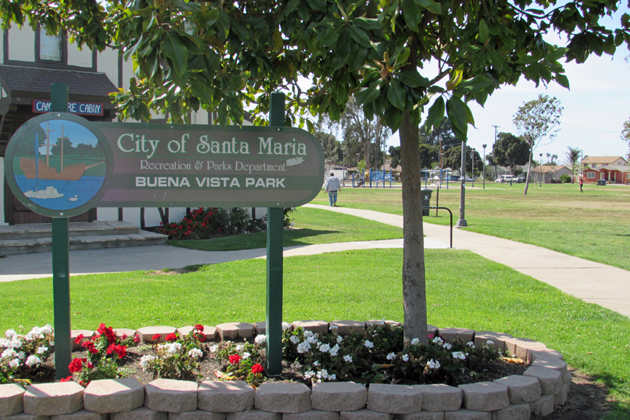 A multipurpose trail in Santa Maria sports a new name to recognize a former member of the Santa Barbara County Board of Supervisors and his years of service to the Santa Maria Valley. “This will be a lifelong legacy for our community and the Urbanske family,” Recreation and Parks Director Alex Posada said during a ceremony celebrating the naming of the Tom Urbanske Multipurpose Trail. The City Council earlier this year agreed to recognize Urbanske's service by naming the trail for him. Urbanske is credited with spearheading efforts to allow recreational uses on the levee trail. The approval process for naming the trail took approximately a year after Jeanne Sparks and Barry Stotts first presented the proposal to city officials. “It took awhile, but it got done,” said Sparks, who worked as Urbanske’s aide while he was a county supervisor and now is with Santa Barbara County Action Network. “And we have to thank the staff for their effort on it because it did take coordinating with the county and they made that happen. We’re just happy,” Sparks added. By Janene Scully, Noozhawk North County Editor | @JaneneScully | May 16, 2016 | 10:40 p.m. The Fund for Santa Barbara recently awarded a $7,500 grant to Santa Barbara County Action Network to support the organization as it addresses environmental, social justice and civic engagement issues. During 2016, SBCAN plans to develop initiatives and seek implementation funding in the following areas: 1. Healthy communities coalition, building on the State of California’s Health in all Policies Program, 2. Bicycle and pedestrian safety in North County, seeking to emulate similar initiatives in South Coast, and building on the Santa Barbara Bike Coalition’s plan to retain staff in North County, 3. Risks from transport of highly volatile oil to the proposed Phillips 66 rail terminal, 4. Community Choice for Clean Energy, 5. Promoting raising the minimum wage, and 6. Promoting even-year local elections to help ensure more voter participation. SBCAN received the grant on January 4. For more information about SBCAN, visit www.sbcan.org, or email info@sbcan.org, or call (805) 563-0463.